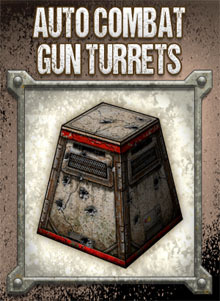 These pillbox bunkers can be used as gun turrets in arena battles, as gate markers in death races, and as camera towers to capture the action. This cardstock print-and-build terrain kit is easy to assemble, requiring just some cardstock paper sheets to print on (index-weight cover stock paper is recommended), a hobby knife, paper glue, metal ruler and cutting mat. 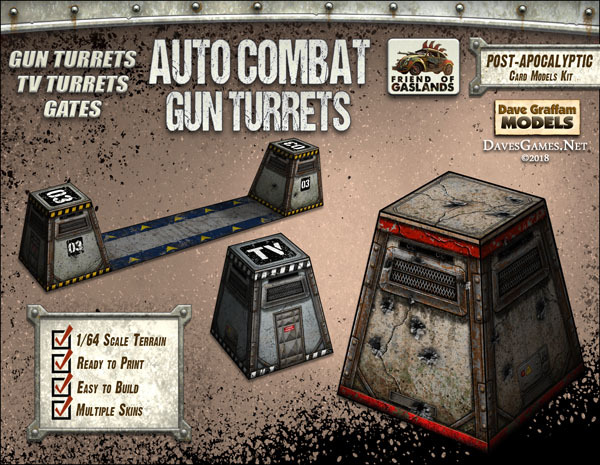 The models in this set are designed for 1/64 scale die-cast cars and 20mm-25mm wargames. The components can be printed at other common gaming scales by adjusting the print size percentage on your printer. (Note that if you want to print these files at a larger scale, you will need to print on larger paper such as A3 or 11"x17".) Tips and advice for altering the scale are included with this kit. For your convenience, this kit includes a selection of prepared JPGs and PDFs that are ready to print. This set features multi-layered PDFs that offer a variety of color schemes and optional details. Layered PDFs are a fun and easy way to customize your models with a few mouse-clicks before printing.